Pam Rhodes is best known as the familiar face of the BBC's Songs of Praise, and here she brings together her personal selection of carols, poems, Bible readings and other inspirational passages from a wide range of sources. As well as the usual old favourites - from Hark the Herald Angels Sing to the stories of the shepherds and the wise men visiting the baby Jesus - there are plenty of lighter moments, with excerpts from Gervase Phinn's memoirs and funny poems by modern writers. Alongside the items themselves Pam shares some of her own Christmas reminiscences and explores the resonance of the Christmas story for all our lives in her trademark inviting and heartwarming style. The middle of November is normally far to early to be thinking about Christmas, but it's clearly already on many people's minds especially with Black Friday coming up and the countdown of shopping days has already begun. So it is probably the right time to have a look at this book from Songs Of Praise presenter Pam Rhodes. 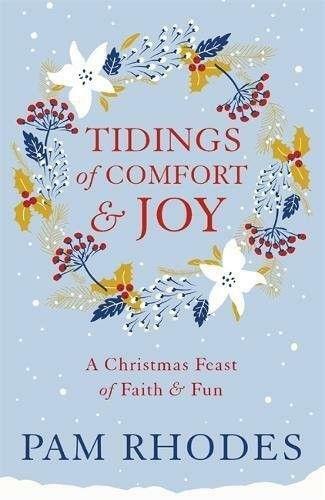 Here she presents this book "Tidings Of Comfort And Joy" which was initially published in 2015, but with limited exposure has been reprinted this year in plenty of time for the festive season. This book has a wide possibilities for audiences, although I think it will probably suit older readers the best, having said that, I quite enjoyed the blend of anecdotes, thoughts and ideas and of course explanations of bits of the Christmas story. Within Christian circles there are people who feel that we are moving away from the origins of the celebration and Pam does a great job of balancing that line of thinking with embracing the more commercial elements of the festive season. She lays out the familiar ideas of Father Christmas with Saint Nicolas, Black Peter and the evolution into the Santa Claus that we know today. She does this in an entertaining fashion interspersing information with readings, poems and other quotes and writings. She goes through various elements of the Christmas story, from the announcement of the birth of Jesus, along with some ideas of when Jesus' birth actually took place including information about how people have identified the most likely date and time of year, and how this matches with why we celebrate Christmas in December. She doesn't forget that Jesus grew up and had a mission when he was older, but the real focus is on how the story can influence our thinking. There are some funny and thought-provoking Christmas related anecdotes in this book, and I am sure that many ministers looking for inspiration for their advent services would find this book useful. I had heard many of them before, but there were a couple that required relaying to other members of my family because they tickled my sense of humour. This is a book that is written with a gentle touch. It has a soft subtle sense of fun, humour and, most of all, warmth running through it. It contains a lot of Pam's personality on every page. I loved the stories about Pam's home life at Christmas, particularly the bit about her husband getting very possessive of the Christmas lights. Of course these days it's all LEDs and they are not quite the same as the old fairy lights around the house or on the tree. I think the older generation will love this book to remind them of tradition, years gone by and of course the Birth of Christ, the very reason that so many people celebrate December 25th.